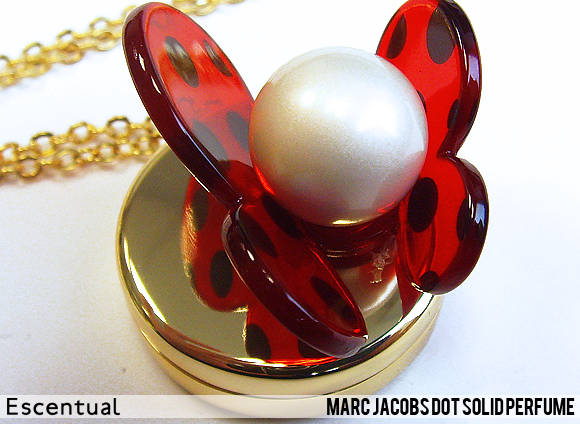 If you’re searching for a sweet gift for Valentine’s Day, then consider the brand new Marc Jacobs Dot Solid Perfume Necklace, a wearable version of the bestselling Dot fragrance. 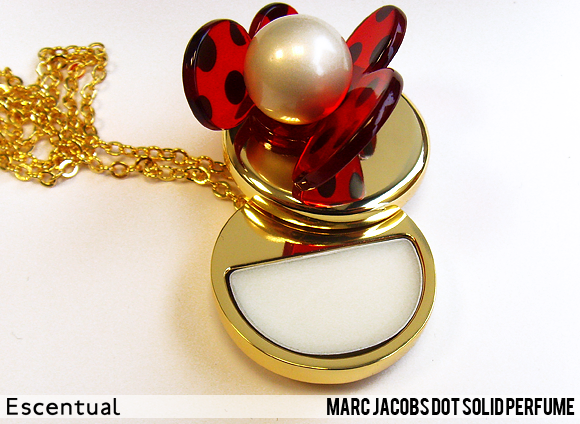 Every year Marc Jacobs introduces a new limited edition talisman to his core perfume line-up. In the past we’ve seen offerings from Lola and Daisy (including this beauty from 2011). This year, it’s the turn of his brand new scent, Dot, to be given the luxurious solid perfume treatment. 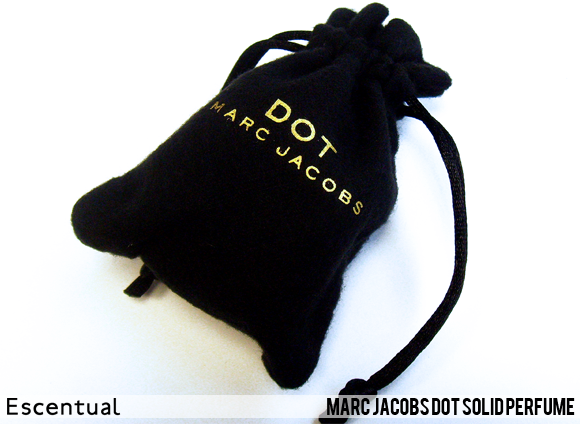 When you open the box of the Dot Solid Perfume Necklace, you’ll find this soft little bag printed with the Dot logo. It doesn’t just look great, it’s practical too – keep your necklace protected in the pouch when you’re not wearing it and it will help to keep the metal scratch-free. The link chain necklace is very long, 71cm long in fact, which counterbalances the weightiness of the pendant nicely. The practical length of the chain allows for easier access to the fragrance when you’re out and about. Like the Dot Eau de Parfum, the design atop the pendant is based upon the Dot butterfly, with an oversized, artificial pearl at its centre. 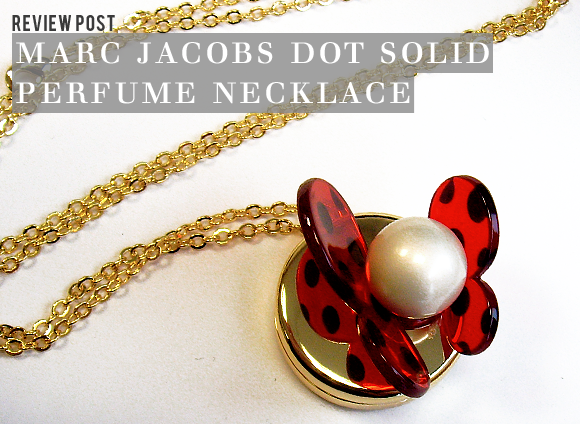 This eccentricity, when paired with the elegant, smooth gold of the pendant base, epitomises the playfulness of Marc Jacobs’ style. 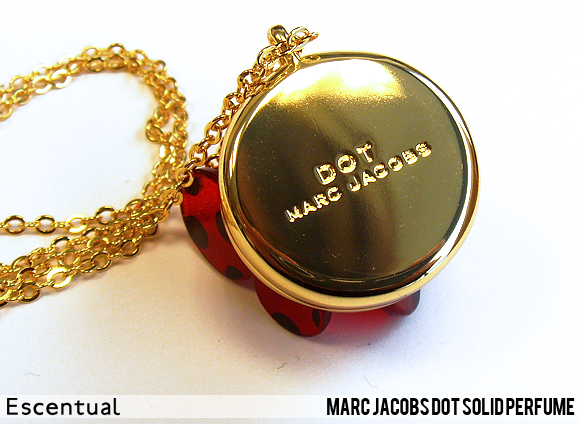 Turn the pendant over and you’ll find the Marc Jacobs Dot logo embossed on the bottom. It’s a nice little touch that adds to the overall feeling of luxury. Swivel – don’t pull! – the top of the pendant around to reveal the scent. Run your finger over the solid perfume to heat it a little, and then apply it to pulse points. It has the same scent as the Dot Eau de Parfum, but its unique texture brings out the orange blossom and the deeper, creamier base notes a little more. 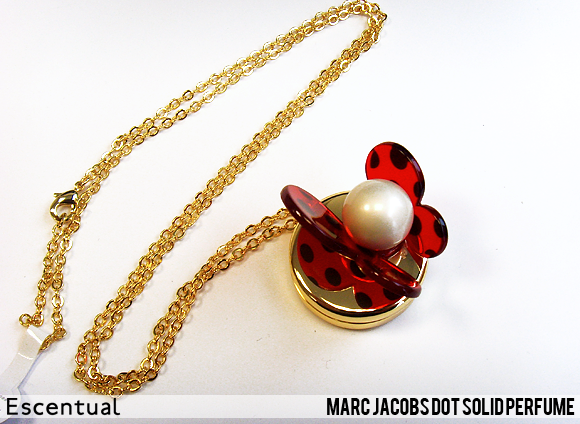 Shop the Marc Jacobs Solid Perfume Necklace at Escentual. This entry was posted on Tuesday, February 5th, 2013 at 11:50 am and is filed under Fragrance, New products, Tried & Tested. You can follow any responses to this entry through the RSS 2.0 feed. You can skip to the end and leave a response. Pinging is currently not allowed.